To be honest, whenever I hear the word rustic, red flags usually go up. Sometimes rustic seems synonymous with a rat-infested shack, but then other times it just means that the accommodations are bare-bones, clean and a bit off-the-beaten-path. 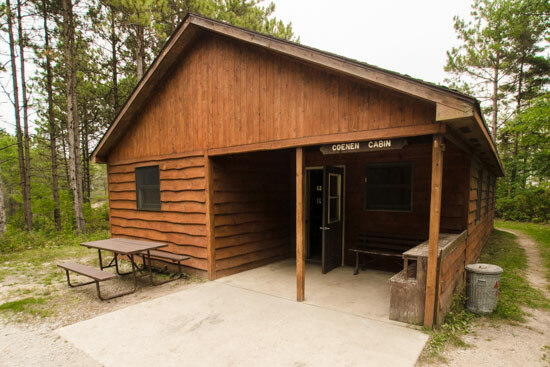 Fortunately the latter is the case with the Coenen Cabin in Point Beach State Forest (920-794-7480, dnr.wi.gov/topic/parks/name/pointbeach), on the western shore of Lake Michigan. Located about an hour-and-a-half north of Milwaukee, this pine and hemlock forest is the perfect place to get back to nature and unwind. 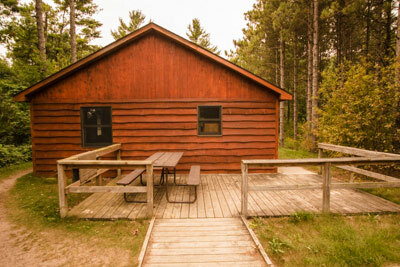 At first I was a bit put off by the description of this lakeside cabin, as it was billed as an indoor group camp cabin. That said, it’s outside of the main campground with just one other cabin nearby. And if nobody is in that other cabin (which certainly was the case for our visit) you’ll have this lovely little piece of real estate all to yourself. The price is right too — just $60 per night. There’s plenty of room to park on a level dirt space in front of the cabin, with level access up to the front door. It’s furnished with eight bunk beds, and can accommodate 16 people, but it’s perfectly comfortable for a couple or a small family. The bottom bunk is just 18 inches high, so it’s a good transfer height for wheelers. 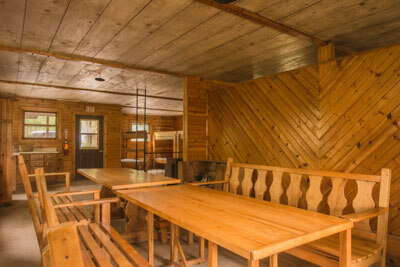 The cabin also has a large table, a kitchen counter with food cabinets, and a wood burning stove for heat. There are no lights in the cabin, but there is one electrical outlet, and plenty of spots to hang lanterns. There is no running water in the cabin, but fresh water is available from the pump outside the pit toilets. 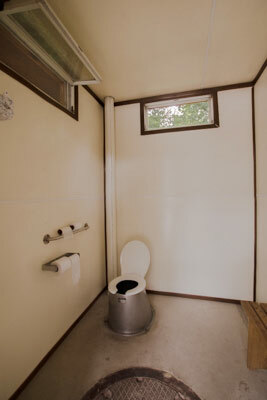 The pit toilets are located next to the cabin, and they feature accessible stalls with grab bars on both sides. 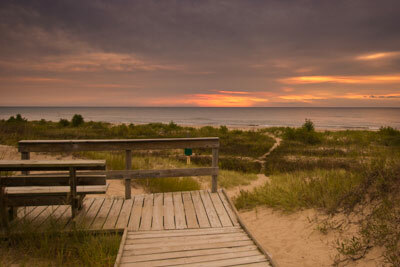 There is also a deck out back, and a wheelchair-accessible boardwalk that leads out to a Lake Michigan overlook. It’s the perfect place to enjoy the sunset. 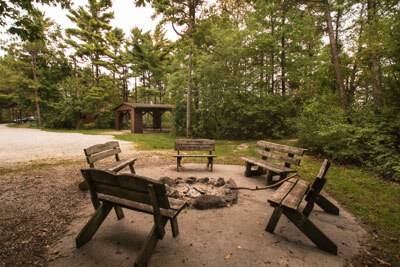 A large covered picnic shelter, with a charcoal grill and accessible picnic tables, sits next to the cabin; and there is an accessible fire ring at the end of the road. There are no showers in the cabin (remember it’s rustic), but there are some just down the road in the main campground. The most accessible choice is the private accessible shower room near campsite 31. 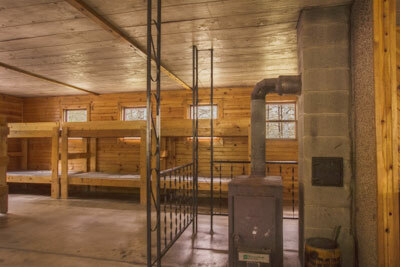 You will need to get a key from the camp office to access it, but it has a full five-foot turning radius and is equipped with a 36-inch wide roll-in shower with grab bars, a fold-down shower bench and a hand-held showerhead. There is also a toilet in the shower room, with grab bars on the left and back walls (as seated), as well as a roll-under sink. Another accessible shower room is located next to campsite 119. This one does not require a key, and it has all the features of the other shower room, except that the shower is 29-inches wide. Be sure and stop by the Nature Center while you’re in the campground. There’s accessible parking in front, with level access to the front door. Inside there are a number of interpretive exhibits, as well as naturalist programs on the weekends from Memorial Day to Labor Day. There is also an accessible lakeside picnic area outside. Don’t miss the Rawley Point Lighthouse on your way out. Billed as one of the largest and brightest lighthouses on the Great Lakes, the light sits on a tower that rises 113 feet above the lake surface. Before it was erected, some 26 ships were stranded on the point. A picnic area with two accessible tables and an accessible pit toilet is located nearby. It’s a nice place for a picnic lunch, with a good view of the lighthouse, and a perfect addition to a rustic Lake Michigan getaway.